The line to Chesham was for a while the terminus of the Metropolitan Railway. 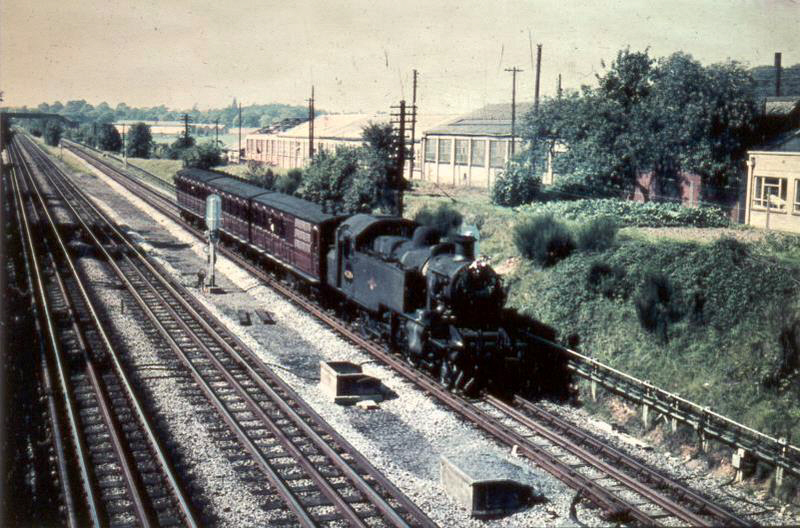 When the Met pushed out from Harrow and Rickmansworth in the 1880s, Chesham was the destination. There were proposals to link on from Chesham to the main London Euston to Birmingham line around the Tring area. Indeed, some land north of Chesham station was acquired for this purpose. I wonder if Watkin the then Chairman of the Met had a wry smile to himself when the people of Chesham actually raised funds to locate the station in a more central location as opposed to the proposed station in the Waterside area. 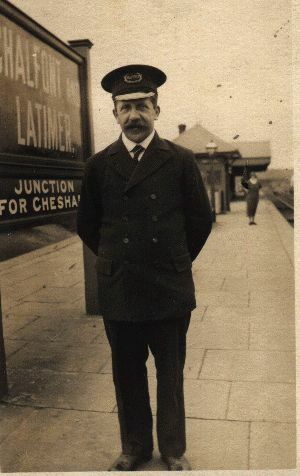 If Watkin already had plans to extend beyond Chesham, he must have been delighted to receive the funds from Chesham to extend the railway to central Chesham. The line from Chalfont Road (now Chalfont & Latimer) was single track, it being double up to Chalfont. When the main line was diverted through Amersham to Aylesbury, the line to Chesham became a branch line, with a shuttle service from Chalfont & Latimer to Chesham, with a few through trains to and from London each day. 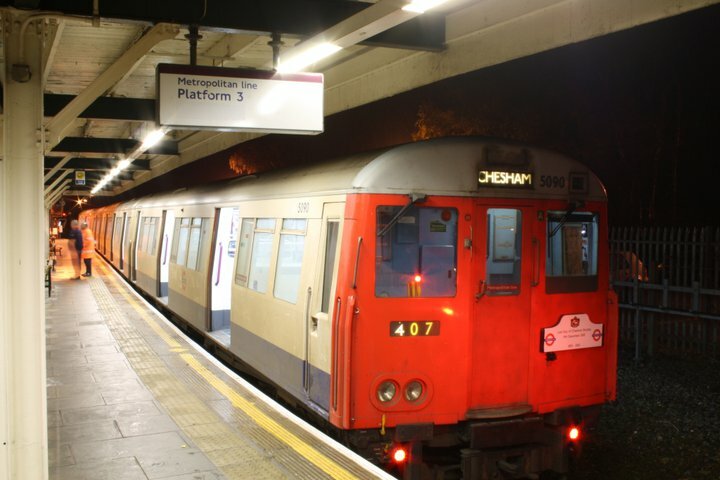 In December 2010, the Chesham Shuttle service officially ended, with through trains to London running all day. When I was young, I remember the service was referred to by some as the "Chesham Flyer" although the name "Chesham Shuttle" was more widely used. David Pickering has informed me "the name Chesham Flyer came about after a train accident at Chalfont and Latimer in 1961 when a train ran into the buffers. My father was the driver of that train, Jim Pickering, and as of that accident he was known by his fellow drivers as the Chesham Flyer"
The above picture shows loco of 41284 on the Chesham branch approaching Chalfont & Latimer on 11 September 1960. Note the track is already electrified and steam services would soon end. The coaches are the famous "Ashbury" stock, some of which are now preserved on the Bluebell Railway. See the link here for details of their preservation. These coaches had a long life, first built in 1898 with others in 1900, they were converted several times and ended up being fitted as auto train coaches, this meant the engine driver could drive the steam train from the front of the coach, while the fireman remained on the locomotive. This saved having to run the engine round the train at each end of the line. When electrification came to the Chesham branch some through services to the City were hauled by the Met's electric locomotives, thus avoiding the need for the change of steam to electric locomotives at Rickmansworth. 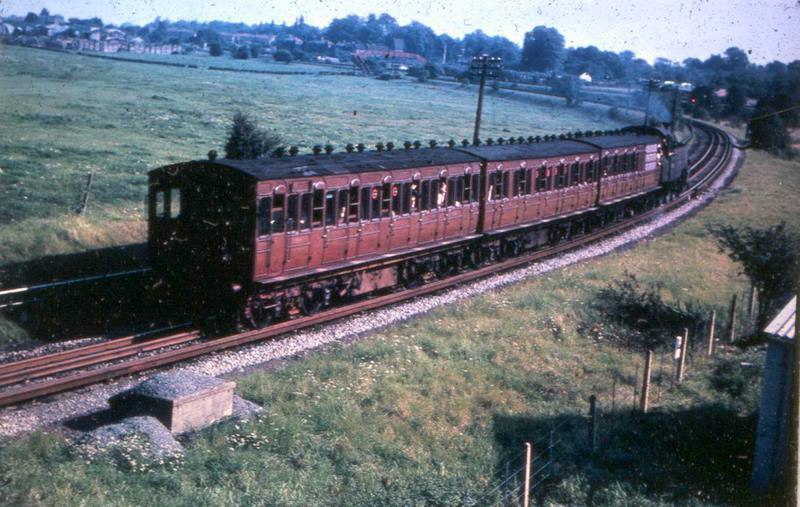 When the line was electrified in 1961, the then new A60 stock formed the rolling stock for the line (although other electric stock made an appearance in the early days of the electric service). A four car unit was used to form the shuttle to and from Chalfont. A new bay platform was built at Chesham to allow the shuttle train to be at Chesham when a through 8 car service was operating in the rush hour. This bay platform has been removed which meant if the through trains were late, the shuttle had to wait at Chalfont for the line to clear. 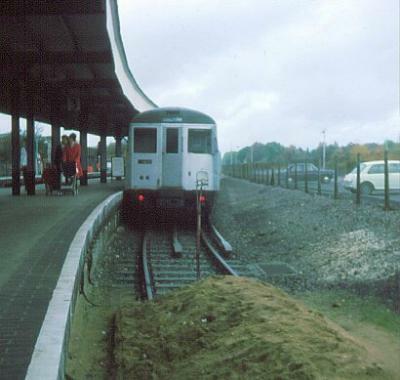 An A60 stock train waiting at Chalfont to form the Chesham shuttle service in December 1975. Chesham has always enjoyed through trains to and from the City in the peak hours (often in the past to and from Liverpool Street) and Saturday lunch time (workers used to work Saturday mornings). The Saturday through service was removed many years ago, but two peak hours services remained. 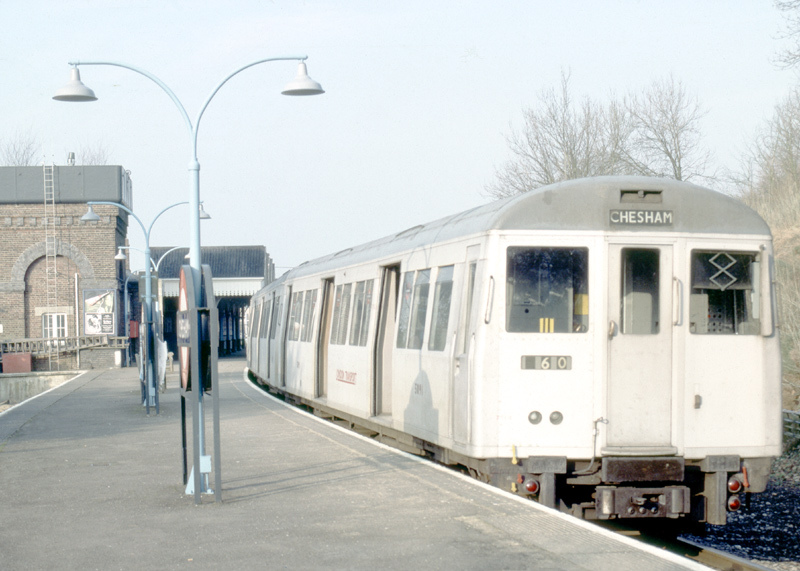 There were often proposals to cut these services as they can cause delays in the timetable for the rest of the line, but pressure from the Chesham commuters and other interested bodies maintained the service. An A60 stock train waiting at Chesham. 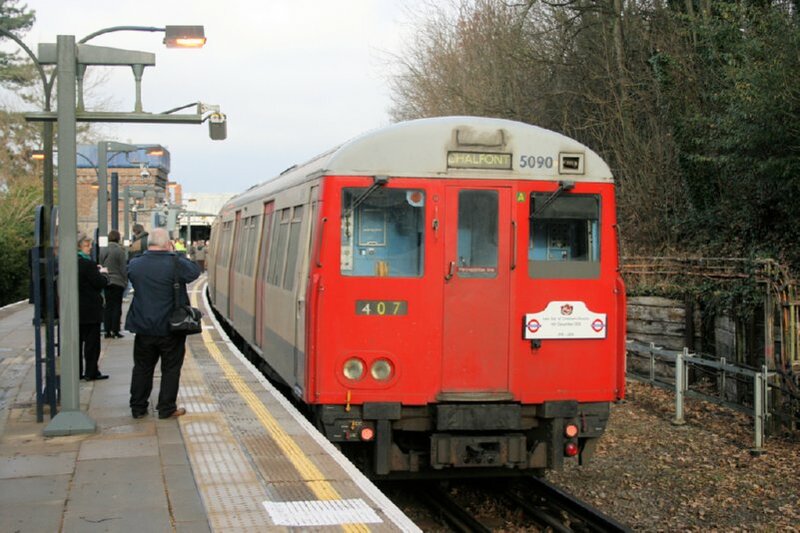 With the introduction of the new S stock onto the Metropolitan line from 2010, the shuttle service could not be maintained. Owing to the short bay platform at Chalfont & Latimer, the shuttle service had been provided by a 4 car train. The new S stock trains are all 8 cars long (for the Metropolitan line, there will be 7 and 6 car trains for the District, Hammersmith & District and Circle lines) and are thus too long for the bay platform. Rather than extend the bay platform and relocate the points to the branch line at Chalfont, the decision was taken to end the shuttle so that all trains to Chesham are 8 car through trains. The last official shuttle ran on 11 December 2010. A public consultation on the shuttle had been held and the public had voted for a through service. Time will tell how reliable the service is as the points at Chalfont now have to work many more times a day and any delay on the Metropolitan Line will affect Chesham trains, this may be particularly bad during the leaf fall season. When the shuttle had run it often ran without problems being not dependent on the service on the rest of the line.. Almost immediately after the shuttle service ended, it was temporarily re introduced owing to very heavy snow. This flexibility will be lost when there are no more short A60 trains. Chalfont & Latimer thus is no longer a "Junction for Chesham" and will become even quieter. Much changed from when it was a junction with its goods yard. The last day of the shuttle was marked by a small "celebration"
The shuttle on its last on the last day at Chesham. The rather grubby A60 train attracted quite a bit of attention. Apparently, problems with the washing plant caused its less than perfect condition. 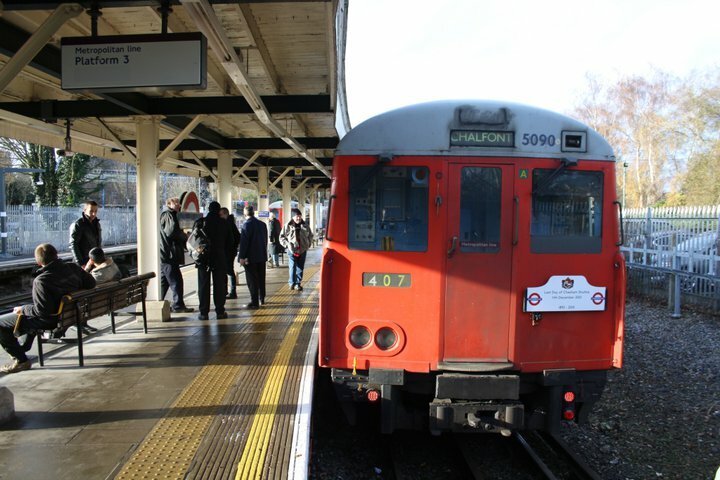 On the last day of operation, the Chesham Shuttle waits at Chalfont on 11 December 2010, complete with commemorative head board.